Choosing a good running hydration belt can be one of the most exciting choices you`ll have to make as a runner. There are thousands of models to choose from and you`ll have to consider finding the best solution for your needs. However, there are some characteristics which are universal and apply to all runners. Some of these universal features can involve a bottle holder, a headphone pocket or even reflective strip inserts which can keep you safe in low light conditions. With the rise of smartphones, you also want to ensure your belt can offer the right storage options which allow you to concentrate on running. Another important characteristic of a good hydration belt comes with adjustability. You want to ensure your belt is ready to be used at all time but that it also fits your body while minimizing discomfort. 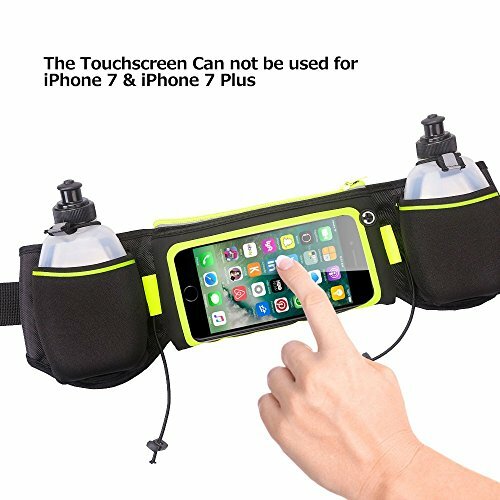 The Fanny Pack MYCARBON Waist Pack with Water Bottle Holder comes with a water-resistant construction which makes it perfect for all types of weather conditions. The belt is up to date with the latest requirements for smartphone holders. Thus, it will work for some popular phones like the iPhone 7 and 8s but also for the Samsung Galaxy S7 and S7. The running belt is a comfortable choice for all your basic accessories. It can store your water bottle right in the front of the belt which gives you easy access even while running. The belt is also one of the best options in terms of up to date storage on phones and accessories. Thus, together with your smartphone, you will be able to store your IDs, keys and even a pair of headphones. The belt can be a great choice for multiple sports. Since it will hold many types of accessories it can be used by both men and women. The adjustability of the belt allows you to find a great fit which doesn`t come in the way of your performance. The iRainy Neoprene Water-Proof Hydration Running Belt comes with an innovative design which is geared towards hydration and connectivity. At the front of the belt, you get a zipped pocket for your smartphone which also comes with a small hole for your earplugs cable. On the sides, you will get two 12oz water bottles which come with a smart design against leaks. The belt comes with a design oriented towards hydration and smartphone connectivity. The two included water bottles are a great addition to any type of activity like running or walking. You will be able to place your smartphone in the front of the belt which will allow you easy access to the pocket and the headphones. The belt represents a good option if you only want to carry a limited number of accessories which include hydration options and a smartphone. With an adjustable design and reflective pads, the belt represents one of the minimalistic options which can be used for a varied number of activities. The Running Hydration Belt with Water Bottles comes with two water bottles for proper hydration. 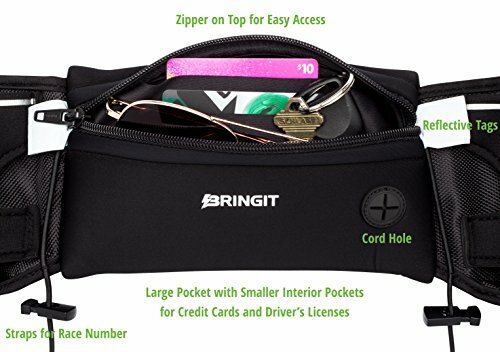 This design would suit someone also looking for a front pocket for other accessories such as a smartphone, keys or IDs. The belt comes with an adjustable and minimalistic design which might be a good option for an intense activity like running. 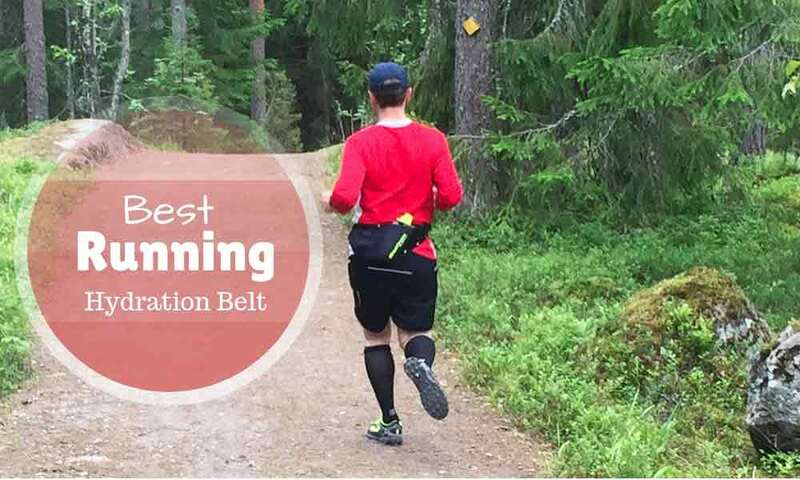 The belt represents a good option for many types of activities such as running, cycling or walking. It comes with an intuitive design which is made for good hydration and to protect your valuables such as your smartphone and your IDs. The belt also has good adjustability which will work for both men and women. If you are looking for a simple belt with a good grip, it might be the right option for you. With interior gel pads which prevent slippage and improve grip, you will be able to use the belt for all types of physical activities. These tree belts have their own strengths and weaknesses. 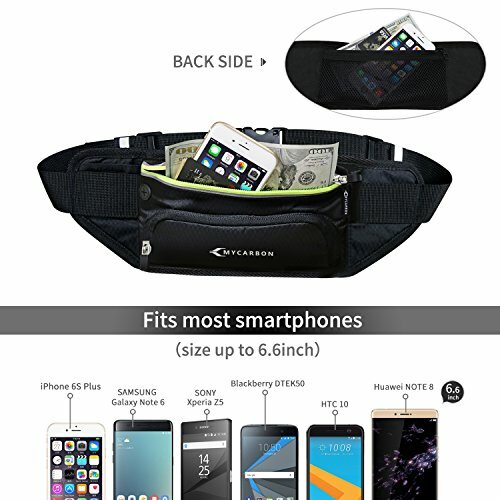 If you want a complete option which can hold a standard water bottle together with your phone, money, IDs, keys, and headphones, the Fanny Pack MYCARBON Waist Pack with Water Bottle Holder can represent a good option for most needs. If you prefer a minimalistic design which combines good hydration with a basic pocket for your phone, the iRainy Neoprene Water-Proof Hydration Running Belt can represent a solid alternative. Together with the Running Hydration Belt with Water Bottles, they represent the options for a minimalistic design with two water bottles. To choose the best option for your needs, you will need to assess which accessories you`ll need apart from the water bottle. Choosing the best hydration belt can be easier if you plan ahead and know what type of accessories you`ll actually use. If you don`t plan to take too many of them, you can limit yourself to minimalistic design. The more accessories you carry the bigger the bounce of the belt will be. You should also consider that the more accessories you carry the bigger the bounce will be. This is why having an option which includes an improved grip to reduce bounce can also be a good recommendation for most activities. Hydration is sooo important! And finding a good hydration belt can be so time consuming! I like my flipbelt! What’s up to every one, flip belt is great!